As the first Jesuit pope, Francis is steeped in Jesuit spirituality and communal discernment. "I don't have all the answers," he says, so we need to dialogue and discern how the Holy Spirit is leading us today The Cardinals elected him to reform the Vatican Bank and the Vatican Curia, but has surprised them, and upset a few, by moving far beyond these simple reforms. He calls for a Church of mercy, rather than rules, a Church of discernment, rather than fiats. Fr. 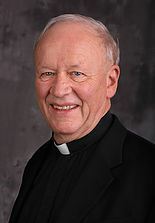 Patrick Howell, S.J. grew up in Lisbon, North Dakota, and then graduated from Gonzaga University before entering the Jesuits in 1961 in the Oregon Province. Further studies included Boston College, the Gregorian University (Rome), and Catholic University of America. He was a high school educator for 13 years and for the last 32 years has been a professor and administrator at Seattle University. He was a co-founder in 1985 of the School of Theology and Ministry at Seattle University. About 60% of the graduate students at STM are Protestant or Anglican; many are preparing for ordination. Catholics are preparing to be pastoral associates, chaplains, and spiritual leaders. He has taught courses such as Psychospiritual Develoment, Catholic Imagination in Art & Film, Theology of Vatican II, the Christian Church in the 20th century, Pastoral Leadership, and so forth. He is the author of Reducing the Storm to a Whisper: the Story of a Breakdown (available at Ulyssian Press, 2001) and A Spiritguide through Times of Darkness (Sheed & Ward, 1986). He has been the chair and general editor of Conversations magazine published by the National Seminar in Jesuit Higher education for all the 28 Jesuit universities’ faculty and staff since 2011. Fr. Patrick joined Loyola Institute for Spirituality in August 2017 as Interim Executive Director.